太阳同样是象征性的，如心脏. 太阳一直代表诞生, 生活, 自古以来正能量. 这也意味着活力, 活力, 动力和勇气. 其中一个太阳的深层含义是转世重生或; 正如太阳上设置再次上升, 人类也诞生了，他们死了之后再. 太阳和月亮纹身工会代表欢聚, 爱, 关系, or even sexual union of two partners. 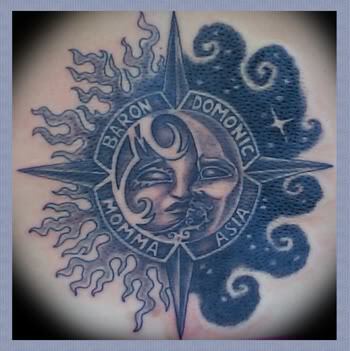 Although the sun tattoo is considered a masculine design, it is equally popular with females. Read more on sun tattoo meaning.